Another London squash facility is under immediate threat. The Sobell Leisure Centre in Islington has been earmarked for redevelopment - which would mean the loss of the squash courts there. The original plan to knock down Sobell is supported by Liberal Democrat councillors - being led by Councillor Ruth Polling. All other parties are in favour of either refurbishment or a second stage consultation with refurbishment as an option. The Islington North MP, Mr Jeremy Corbyn, is also against the Centre being knocked down. A refurbishment plan for Sobell has been produced by Mr Peter Baird on behalf of Mr Gordon Kerr and England Squash. c. you are in favour of replacing the existing building with a new one. Please add your name and state whether you are a local resident (address or postcode will be needed) and/or a Sobell user. If a user, please state your main activity/ies. 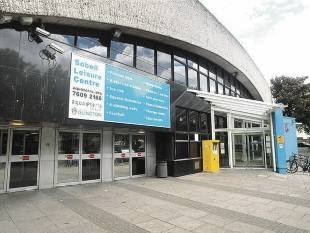 As previously reported on squashblog, Sobell's sister centre - Finsbury Leisure Centre - is also under threat. With the closure of Lambs Club, squash provision in and around the Square Mile is in danger of becoming limited to private members' clubs. If you support the retention of the courts at the Sobell Centre, please email Mr Hill before the 10th September.